Note: By their nature, radar images use color as a means of communicating information. This can be a problem for people with color vision deficiency. Visolve is a software application (free for personal use) that transforms colors of the computer display into the discriminable colors for various people including people with color vision deficiency, commonly called color blindness. There are two precipitation images made available via the web: One-hour Precipitation and Storm Total Precipitation. These are estimated accumulations only. The maximum range of these two images is 124 nautical miles (143 statute miles/230 kilometers) from the radar location. They will not display accumulated precipitation more distant than 124 nautical miles, even though precipitation may be occurring at greater distances. To determine accumulated precipitation at greater distances you should look at adjacent radars. A One Hour Precipitation image. Just as the name implies, this is an image (right) (below) of the estimated precipitation during the previous hour. But also as in the case of other Doppler radar images, there needs to be some caution in viewing this image as there are two main factors to consider. First, while the radar does a great job at correcting itself, there are times when the radar will be out of calibration. If the radar is "hot" (reporting echoes too strong) then the rainfall estimates will be an overestimate. Conversely, a "cool" radar will underestimate the precipitation. Always check nearby radars to see if they are reporting similar information to what is viewed by your local radar. Second, hail makes an excellent reflector of energy. Thunderstorms with hail will overestimate the amount of precipitation and the larger the hailstones, the greater the overestimate. Besides estimating rainfall, both the static and looping One-hour Precipitation images can provide other useful information. This image is a good way to track individual storms. The overall motion of the storms is indicated by the large yellow arrow. However at #1 (above) there are storms moving in three directions. The first thing to notice is storms DO NOT always move parallel to the upper level winds. Some storms can move left, or right, of the upper level flow. Thunderstorms also do not always move in straight lines. Sometimes they curve as in the case of the two small storms to the right of #2. This is valuable information as storms that tend to move right of the main airflow, either in a straight line or curved path, are often capable of producing severe weather. These "right movers" may be difficult to see on looping Base Reflectivity images but the rainfall pattern they leave behind can be invaluable in knowing which storms require extra attention. 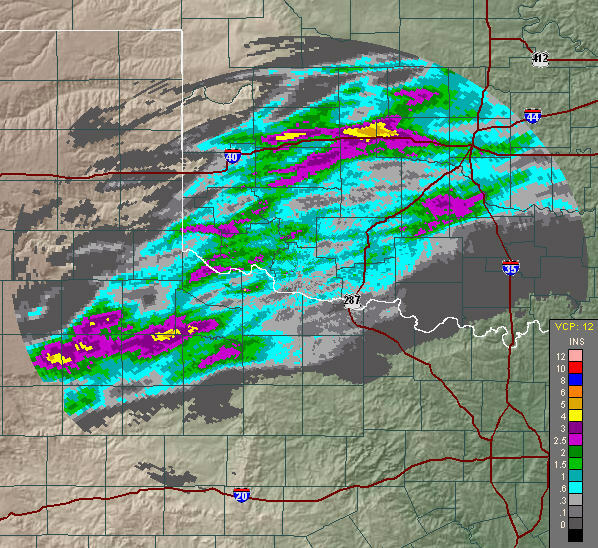 A Storm Total Precipitation image. Just as the name implies, this is an image (right) (below) of the estimated accumulation since the precipitation began. The accumulation continues until there is no precipitation for one hour anywhere within the range of the radar. Often, in prolonged rainy periods, this accumulation can exceed five days or more. On the radar page, the accumulation time period for this image is located on the right side, just above the image. As in the case of the one-hour precipitation image the radar does a great job at correcting itself, there are times when the radar will be out of calibration. If the radar is "hot" (reporting echoes too strong) then the rainfall estimates will be an overestimate. Conversely, a "cool" radar will underestimate the precipitation. Always check nearby radars to see if they are reporting similar information to what is viewed by your local radar. Also, hail makes an excellent reflector of energy. Thunderstorms with hail will overestimate the amount of precipitation and the larger the hailstones, the greater the overestimate.